How do you stop your horse from jogging when he should be walking? – That’s a question most dressage riders would dearly love to know the answer to! 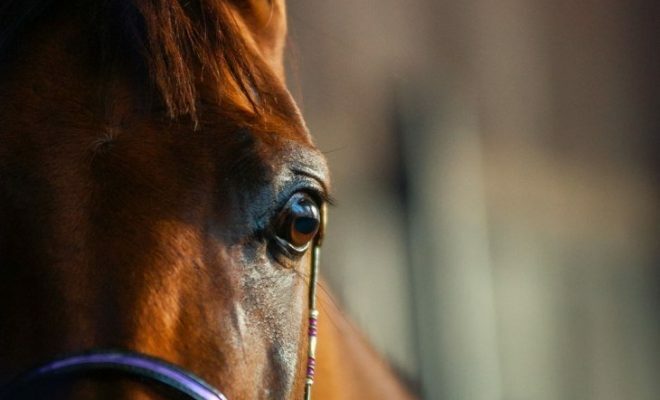 In this article, we explore the reasons why some horses jog instead of walking and show you how you can break the habit. Jogging during a dressage test – catastrophe! If your horse jogs during a dressage test, you can expect to be heavily penalized. Naturally, you’ll lose marks for the walk movement if the horse breaks rhythm and jogs, but you’ll also be marked down in the collective marks too. That’s because jogging can be interpreted as a sign of tension, affecting harmony and therefore the submission collective. 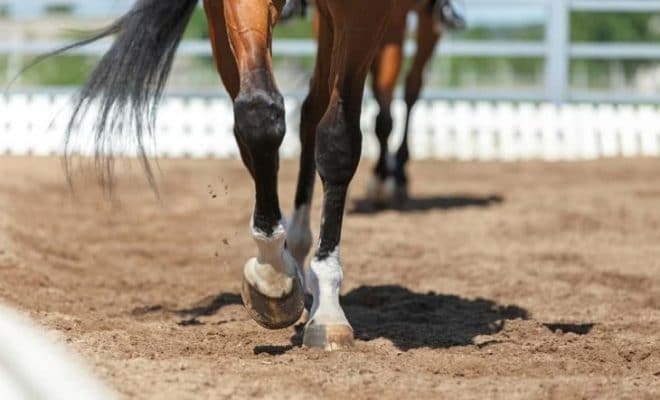 The paces collective could also be hit due to the loss of clear four-beat walk rhythm, especially if the horse jogs during all the walk exercises in the test. Finally, you’ll lose a mark in the rider collective, because your lack of effectiveness allowed the horse to jog. 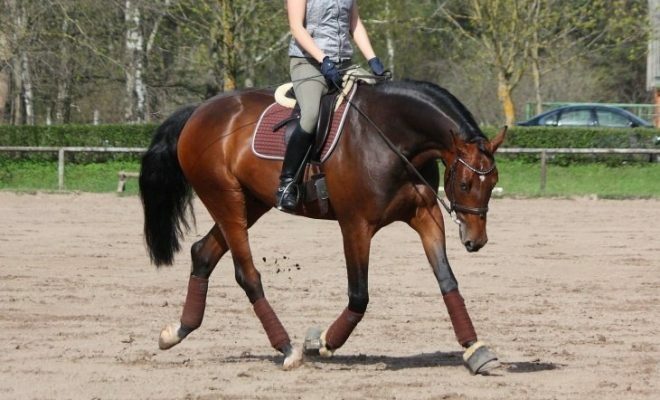 So, you can see that jogging instead of walking during a dressage test is an expensive habit you must correct! Some horses lack confidence when taken to an unfamiliar environment. That can manifest itself as tension and excitability in a dressage test and is frequently exposed during the walk when the horse jogs. You can help to cure this problem by taking your horse to lots of different places, not necessarily to compete. Hiring an arena away from home is a really useful and effective way of helping your horse to relax and become accustomed to working in a strange environment. Sometimes, revising your basic aids can help cure the habit of jogging. The aid for trot can “sound” very similar to the aid for walk, as far as your horse is concerned. Practice riding a slight shoulder-in position in the walk to encourage your horse to listen to your inside leg, rather than jumping away from it. When you ride the walk, don’t take your leg off if you think your horse is about to jog. Keep your leg on, maintain an elastic contact, and think about keeping the correct, four-beat rhythm. 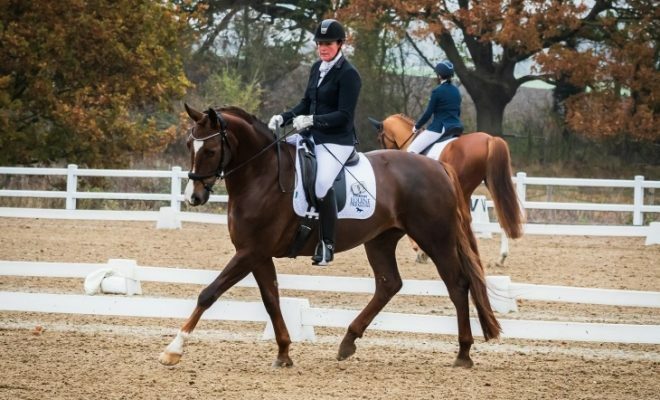 In some dressage tests, you are required to make a transition directly from the walk into the canter or from free walk to medium walk, and then straight into trot or canter. Unfortunately, too much practice at home can lead to your horse anticipating the upward transition. Hence he jogs in the walk. So, when schooling at home, be sure to mix up the work and don’t over-practice direct upward transitions. Remember that if you’re tense and tight, your horse will pick up the vibe immediately! If your horse thinks that you’re worried about something, his natural flight instinct will kick in, and your helpful equine partner will be on his toes ready to run away from the perceived danger. So, take a deep breath and try to relax as much as possible during the test. Let your seat sink deep into the saddle, follow the horse’s movement, and allow with your hand so that the horse can walk calmly forward. It’s crucial that your horse learns how to relax and stretch in walk in his familiar home environment, even when out hacking. Then, when you go to a competition, your horse will be less likely to jog. When riding the free walk, allow the horse to take the rein forward and down gradually; don’t suddenly drop the contact! That can cause your horse to feel insecure and may encourage him to jog. Also, when gathering your reins back up, don’t grab them in a hurry. The transition from free walk to medium walk and vice versa should be smooth and seamless. Jogging in the walk during a dressage test is a common and costly fault. 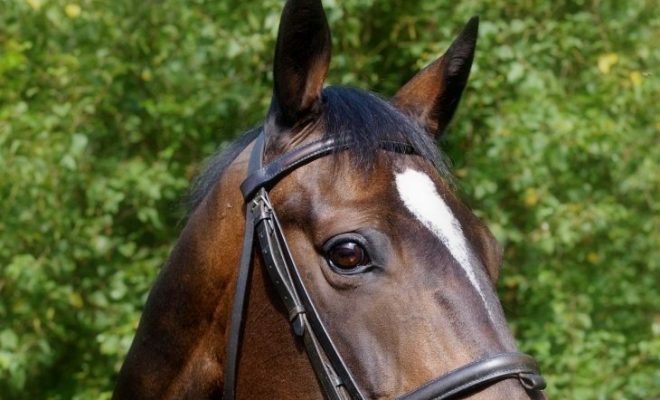 By familiarizing your horse with different environments, revisiting the aids for the walk and free walk, and keeping yourself relaxed, you can overcome the problem. Have you lost marks from jogging in a dressage test? Tell us about your experiences in the comments below!